Ceramic pot depicting nine people. A poem is written on one side. "I was a mad kid and I ain't. I did my 'ead in poster paint, I pinned it up above my bed by the photo of my dead pup, but after what my real dad said I took it down and tore it up. I was a mad kid and now I ain't. I got out 'coz I could paint." Eight small clay brown circles attached. Depictions of two women, two horses and a cross also attached in brown incised clay. Coil built earthenware, decorated with marbled and stencilled slip, impressed and inlaid text and sprigs; sgraffitto accentuated with rubbed in underglaze. Copper oxide painted underglaze, transparent lead-free glaze, photographic enamel transfer. 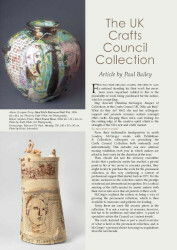 Mad Kid's Bedroom Wall Pot, Grayson Perry, 1996, Crafts Council Collection: P442. Photo: Todd-White Art Photography. 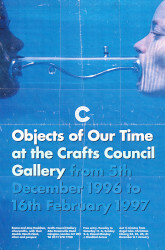 See also catalogue for "Objects of our Time", Dec '96.